Prototype: German Federal Railroad (DB) class 140. Freight train locomotive in a green paint scheme. The locomotive looks as it did around 1989. 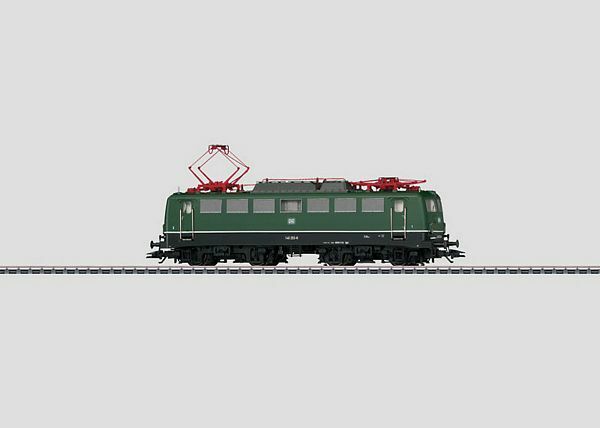 Model: The locomotive has an mfx digital decoder and comes with factory-installed, controllable sound functions. It also has controlled high-efficiency propulsion, centrally mounted. 4 axles powered through cardan shafts. Traction tires. The triple headlights (maintenance-free, warm white LEDs) and dual red marker lights (maintenance-free red LEDs) will work in conventional operation, and can be controlled digitally. The locomotive has separately applied metal grab irons. The engineer's cabs have interior details including a separately applied speed control wheel. Length over the buffers 18.9 cm / 7-7/16.